From balancing company priorities to effectively mentoring staff, it’s easy to overlook your own needs in the process. And while we’d like to think employers have our best interests at heart, they ultimately will do what’s best for the company’s bottom line. That’s why it’s so important to always look out for your future career self. One strategy to help empower your career development is to adopt a contractor mind-set. From this perspective, you will be able to continually evaluate career opportunities, identify ways to keep your skills relevant, and take a proactive approach to managing your career. Much can be learned from the work traits of an independent contractor. Contractors must take ownership of their own career development and stay abreast of the latest trends and required skills in their field or risk being unemployed. They know their self-worth and what unique services they can offer to clients. Additionally, they are always on the lookout for new opportunities and have the flexibility to quit and move on to a new contract if a project is not challenging or is in an unfavorable work environment. Thus, there is a lot of career autonomy that comes with shifting to a contractor mind-set. It will help you stay flexible and open to new career opportunities that come along. And during times of outsourcing and downsizing among the science and technology workforce, it allows you to easily identify alternative employment options (e.g., consulting) during any career-transition periods, instead of being left unemployed or taking a job that is less than desirable. And just as important, it will help you stay focused on your long-term career goals, because you are always strategically planning the next step in your career. Related Article: Time for a Career Change? Overall, thinking like a contractor will help you build the confidence you need to make your career interests a priority and advocate for the resources you need to do your job better. In taking this approach in evaluating your contributions as an individual employee, you will be able to focus on what value your skills and expertise add to the company and regularly communicate that to your supervisors. A couple of activities that will help you develop a contractor mind-set include assessing your career outlook and acquiring the skills needed for the future. Here are some tips on how to do both. In the end, your future career self will thank you for having invested the time now to set yourself up for career success. In the long run, it pays to gain foresight into how the science and technology job market may change over time. Hiring trends fluctuate with workforce demands, technological advancements, and funding availability. 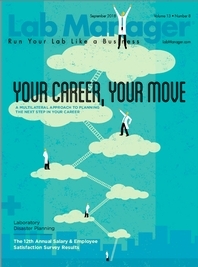 Thus, lab managers need to stay on top of these trends to make good career decisions. There also are multiple ways to find out who currently is hiring in your field. You can browse through science job boards to see what types of positions are being advertised. Recruiters are another good source of information, as they are in touch with employers’ staffing needs and the latest in hiring trends. You can reach out to recruiters directly by contacting recruiting agencies, on networking sites like LinkedIn, or at career fairs and other hiring events. Many recruiting agencies and individual recruiters also publish regular content on hiring topics. Another item that you may want to add to your research list includes trade publications for your specific industry, which often report on changing labor force trends and survey readers about employment factors (e.g., salary, job satisfaction). For example, check out the results from the latest Lab Manager Annual Salary and Employee Satisfaction survey in this issue. Additionally, staying updated on R&D funding news (e.g., grant awards, capital investments) is a proactive way to find out where money is being funneled and thus where potential jobs may be in the future. This information can be found by following relevant companies, foundations, and government agencies on social media to stay apprised of the latest press releases and news related to funding announcements and recent awards. By taking a multilateral approach to assessing your career outlook, you will be better prepared to make smart career moves and avoid getting stuck on a career route that may be a dead end. This information also will help you determine what you need to do (e.g., acquire skills) to get there. As the science and technology workforce is constantly evolving, so are the qualifications required to fulfill the employment needs of the future. Thus, it’s important to continually do a personal skills analysis and identify any additional training you may need to acquire. Overall, the process simply involves asking yourself where you are now in your career development and what skills are needed to get you where you want to be. One way to do this is to look at job postings for career paths of interest and review the list of qualifications for key knowledge, skills, and abilities required in that role. You can also conduct informational interviews with professionals who are working in positions of interest. These interviews are informal (e.g., meet for a cup of coffee) and include a casual conversation to find out more about what the person does, how they got there, and any suggestions they may have for making a similar career transition. Another method for skills identification is to attend trade shows and talk to vendors to stay updated on new technologies that may require additional training. Further, you can take a look internally to see what skills are missing in your own organization and work toward filling those gaps to improve your chances for career advancement and job security. Once you make a plan, the work begins to find training programs and other options that will fit your needs. First, look to see what employer-sponsored education benefits may be available through your current position. This may include in-house training programs or tuition reimbursement programs. Additionally, there may be the option to rotate through other departments. Other ways to gain needed experience include volunteering for special projects or task forces at work. You likely will need to get manager buy-in to approve any training or time spent on other projects, so be prepared to show how it will benefit the company and tie in to any performance metrics, if possible. But if your employer won’t pay for training or you are looking to gain skills outside the scope of your current position for a career transition, you have lots of options that you can do on your own time and are affordable. For example, you may consider completing an education program that is designed for working professionals (e.g., competencybased curriculum) or industry-standard certifications offered through trade associations. There also are lots of quality online courses available through platforms like Coursera, and many provide the ability to create individualized programs and certificate options. Attending workshops at research conferences is another great way to learn new skills in a condensed format. For alternative funding sources to finance your conference attendance, look into options to volunteer (e.g., serving as a poster judge, writing conference abstracts) in exchange for having the registration fee waived. There may be travel grants available through your professional society memberships as well. Additionally, look for any virtual conferences being held, which reduces travel expenses, many of which are free.